Consider collagen an essential building block for healthy, radiant skin. Collagen production slows down with age, but many things can be done to diminish the loss of collagen and even encourage collagen production in the skin. Without collagen, your skin is prone to losing its youthful glow and suppleness. Taking care of the skin you're in is important for a luminous future. Fine lines may show up at a fairly young age. Professor Michael Kimlin from Queensland University of Technology's AusSun Research Lab believes that sun damage that is caused during the first 18 years of a person's life is the most influential when it comes to skin damage. Although a person's skin has the potential to continue to be damaged throughout life, protecting the skin from an early age can play a major role in beautiful skin later on in life. The breakdown of collagen and elastin, which serves to help keep the skin tight and give it its elasticity, will present themselves in the form of fine lines. Eventually, fine lines can turn into full-blown wrinkles. Youthful skin is not only beautiful, but it has a natural fullness that adds volume to the face. Think of the cute, chubby cheeks of a baby. When babies are born, collagen production is at its highest. Dermatologist Nicholas Perricone notes that existing collagen will start to deteriorate around age 40. Generally, collagen production does not occur as quickly as the existing collagen deteriorates at this age. Once full cheeks may begin to look a bit flat. 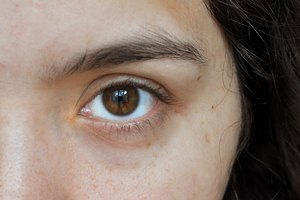 Undereyes can begin to develop hollows due to the lack of collagen under the eyes. Since collagen is essential to give skin its firmness, a lack of collagen will present itself in sagging skin. Sagging goes hand in hand with the loss of volume that can be seen in the cheeks and around the jawline, which can lead to jowls. 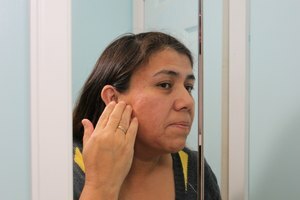 Sagging skin is a direct effect of the loss of volume. Without the volume, the skin may become loose and begin to droop. To aid skin in looking its best for a lifetime, it's important to take steps that will preserve collagen. The sun damages skin and breaks down collagen. Avoiding the sun and using sunscreen help protect skin. Consider using topical products that contain ingredients that work to protect skin and help it look its best. Vitamin C serums that also contain vitamin E can work to increase collagen production. When used in conjunction with vitamin E, vitamin C can serve as a powerful antioxidant. 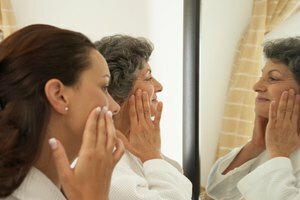 A physician can prescribe a retinoid product, which is a derivative of vitamin A, to increase cell turnover and reduce wrinkles and fine lines. Retinol products, which are weaker forms of vitamin A, can be purchased over the counter; however, they will not produce the same wrinkle-reducing results as prescription retinoids. Neither retinoid nor retinol should be used by women who are pregnant or breastfeeding.